The year got off to an interesting start with The Bees doing a flash mob at The Healthivate Bloggers Conference at Technology Park, Alexandria. Half-way through the morning session after a pitch-perfect yawn from our MD, Jennie Lin began the slightly modified version of Oh! Happy Day (fitting in with the theme - we 'Moved & grooved the blues away' instead of 'Washed our sins away'). It would be fair to say that as a choir we did not get off to the best start due to us being scattered throughout the conference hall but we quickly got it together and made our respective journeys to the stage to finish the song. Judging by the applause and live tweets (a first for us, we think) we went down very well with one tweet saying " I Wanna be in a flash mob - they transformed the energy in the room." We can add that to our two other flash mob experiences (we call them a flash swarm!) at a marriage proposal in a restaurant and just before Christmas in the Queen Victoria Building shopping arcade. Mid April saw The Bees perform at a private paid gig for the Southern Cross University Graduation Ceremony. We sang three songs at two graduation ceremonies. As well as the national Anthem, we sang in Latin for the first time, performing Gaudeamus Igiturs and a number that we are more familiar with - Shed A Little Light. It was an unusual day but well worthwhile and our performances were certainly enjoyed by the audience as well as The University - who have booked us for the next three years! 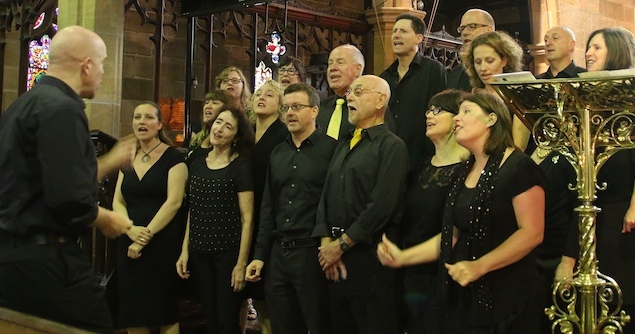 In early May, The Bees joined Soulfood for the A cappella Northside Concert, performing at the state of the art(s) venue at Willoughby Uniting Church. The sell out performance raised funds for the excellent work done by Streetwork. Soulfood are well known for their eclectic mix of motown, funk, jazz & retro-pop songs. The Bees opened with a 40 minute set which was very well received and included Trouble of this World, Love & Joy and All Night, All Day. Of particular note was the brilliant inaugural solo performance by Bern in Jesus Gonna Be Here. The concert raised over $5,300 for Streetwork. 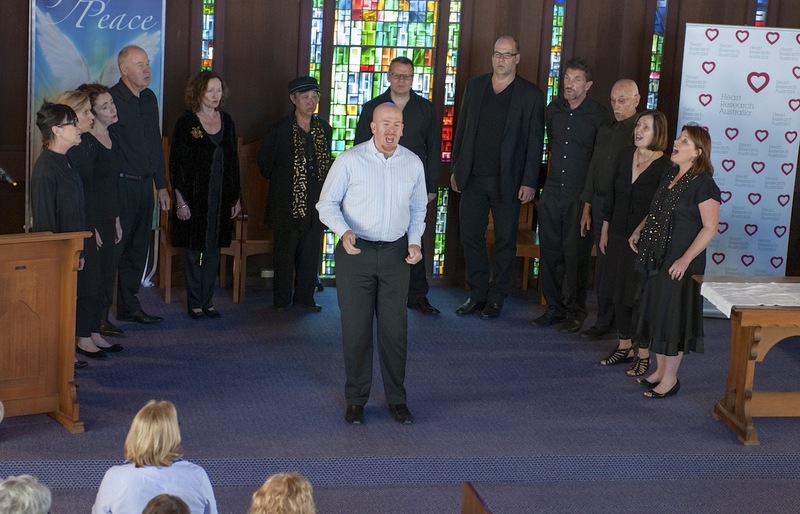 We were invited to sing at one of the services Wayside Chapel in Potts Point in mid June. It was an open door policy and we sang to a packed house where Rev Graham Long spoke a few words. Needless to say, we thoroughly enjoyed the morning and the donation taken up that day by the congregation was given to The Bees. We decided to include this in our fund raising amount for Bear Cottage. On Friday 21st we had the opportunity to publicise our Winter SOULstice concert on the ABC 702 Morning Show. Linda Mottram interviewed our Musical Director Steve Clarke and Assistant Musical Director Jenny Jackson-Nylund, who both did us proud. Bernadette sang our new favourite song Jesus Gonna Be Here and Kate soloed Angels Watching Over Me (click on the links to see the songs on youtube). On the back of this free publicity we had an extra 50 or so booking for the gig and a similar number of walk ins. Our Winter SOULstice Gig at St John’s Church Darlinghurst was a roaring success with over 300 people in the audience. This year’s concert was for the benefit of Bear Cottage and we were delighted to have raised well over $7,000 for this fantastic cause. Our repertoire included a new number called Kingdom that featured Carly & Wes as soloists. Elizabeth’s rendition of Precious Lord was a particularly poignant moment as it followed a mother’s story of her child’s death and the support she and her family received and continues to receive from Bear Cottage. Precious Lord was written by Thomas Dorsey as a direct response to the death of his wife and son during childbirth. This was possibly our best gig and was another major milestone for The Bees. Early October saw a small band of Bees perform at the Heart Research Foundation's Honouring Service in the Chapel at Royal North Shore Hospital. We performed Walk in the Light Angels, Shed a Little Light & Shine. The non-denominational service is an annual event to remember those that have died from or are battling heart decease and also to recognise and give thanks to all of the professionals and volunteers who do such great work in this area. In mid October a small group of intrepid Bees travelled Moruya (a lovely town about 350 kms south of Sydney) to perform at The Moruya Jazz Festival. The Bees Lite sang two sets, the first as part of The Festival of the Voice and the second at a special Gospel Concert where we performed a set following The Strangeweather Gospel Choir from Canberra. Songs included Angels & Jesus Gonna be Here (soloist Bernadette) Shine & Love Just Bubbles Over (soloist JJ) and the 'dueling banjos' version of Never Let Go my Hand with Richard and Kevin vying for the hearts of the audience. On Friday 1st November, we performed a short set at the special Candlelight Tribute called The Lighting of the Sails at Campbell's Cove, near The Rocks. This event was to honour the many Australians whose lives have been touched by asbestos-related diseases and it was hosted by The Asbestos Education Committee and the Asbestos Diseases Research Institute. The Bees sang Shine On, Shed a Little Light, All Night, All Day & How I Got Over. Mid November saw The Bees conduct another of our popular Gospel Groove Workshops. This year we partnered with WEA to reach a new target audience. As usual, the day was a great mixture of singing and learning, with Musical Director Steve Clarke teaching a number of 4-part gospel pieces including Welcome Table, Come Along my Friend, Angels and Nkosi Sikelel' Aifrica - the pan-African liberation anthem. This was given context by Ladd Wheeler's presentation on the history of gospel music and the Abolishionist & Civil Rights Movements. Many of the attendees went on to join us on stage at our Summer Cabaret Concert to perform the songs they learned. This was another very successful workshop with a highly engaged group of particpants. You can see and hear them perform Nkosi Sikelel' iAfrica here. The 2013 Gospel Groove Graduates! Walk in Light, All Night, All Day & Shed a Little Light. On Saturday 7 December, the Honeybees once again took to the stage at Sydney Boys High School to celebrate our Summer Concert, our last gig for the year. This year saw Roland and Tom debut as soloists, performing Down in the Hole and Shine On respectively. Once again we welcomed the 'Graduates' from this year's Gospel Groove Workshop who joined us on stage to perform some of the songs they had learned as part of the workshop. With the sad passing of Nelson Mandela just the day before our concert, the Honeybees, Gospel Groovers and members of the audience came together to sing Nkosi Sikelel' iAfrika (Lord Bless Africa), the National Anthem of South Africa, in memory of this great man. This year, the proceeds and donations from the Summer Concert went to Sir Roden & Lady Cutler Foundation, and we were pleased to have raised $4500 for this great foundation to help them to continue providing emergency transport to those people that need to get to vital medical appointments. The Bees cap off another successful year doing what we love - singing. On Christmas Day, a small group of Honeybees joined in the festivities at the annual Wayside Chapel street party, joining in to sing Christmas Carols to those who are less fortunate than us and don't have family to spend the day with.